How do start-ups innovate? How is the process they follow different from that of large companies? And, how relevant is the process we outlined in 8 Steps to them? 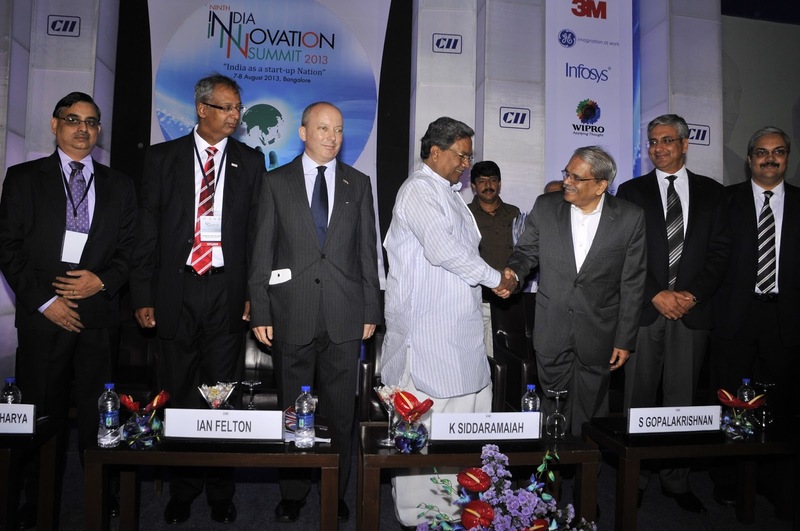 These are the questions Vijay Kumar Ivaturi, ex-CTO of Wipro, and master planner of CII’s 9th India Innovation Summit, posed to us when we proposed to hold a workshop on innovation for start-ups the day before the summit. And, in the spirit of experimentation that we believe is critical to successful innovation, we looked for answers to these questions in the workshop. We decided to work intensively with around 10 companies rather than spread thin over many. But as part of our design, we asked them to register as teams, rather than as individuals. We had a good spread of companies: medical devices, simulator for surgical procedures, tamper-proof labels, compliance systems for new healthcare regulations, online art sale, 3D games on the mobile, etc. The group had several older entrepreneurs. Though our sample is too small to draw any conclusions about the Bangalore ecosystem as a whole, I was enthused by both the range of ideas as well as the experience profile - these bode well for the future of the city where I live! Our participants got the seeds of their ideas from diverse sources: a couple from needs unaddressed by their former employers, some from personal experience, and some from friends or family. But, except for one, all had stuck with their idea even though it had been refined and gone through multiple iterations. All of them had tried to validate their ideas before starting their businesses by talking to experts, potential users and academics. They claimed to have used multiple modes including demos and prototypes to validate their ideas after starting. Yet, we soon learnt that there was plenty of scope for them to push validation harder. Right at the outset, we asked them to identify what they thought was the biggest challenge they faced at this juncture of their enterprise. We then took them through an exercise where they identified the assumptions related to need, technology, production and commercialization that underlie their businesses. They explored these assumptions and rated them on criticality, and extent to which they had been validated. Not surprisingly, they found that some of their most critical assumptions were not yet adequately validated. This made some of them re-think what was their topmost challenge! 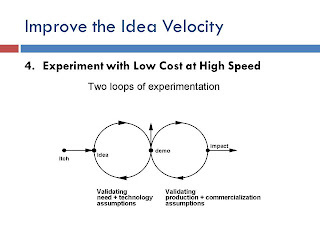 Our experience from the workshop suggests that the identification of the assumptions underlying the business and continuous validation of these assumptions is the most promising area for the application of systematic innovation methods to start-ups. This reminds me of what Peter Drucker referred to this as the theory of the business and echoes the approach recommended by Eric Ries in the Lean Start-up. We found support for the importance of finding champions as well, though here the most important champions are outside the start-up, typically lead users or regulators. The second exercise we did with the group was designed to help them reach out and influence such champions: it focused on how to design a powerful pitch. Here, we used the powerful SUCCES model developed by the Heath brothers, in their book Made to Stick. To make a pitch effective, they advocate keeping it simple, giving the twist of the unexpected to catch attention, giving concrete evidence or examples, enhancing credibility through endorsements or the "self-test", infusing the pitch with emotion, and making it sound like a story. Interestingly, we found that many of the participants did follow some form of a formal review process, perhaps reflecting the maturity and prior corporate experience of our participants . 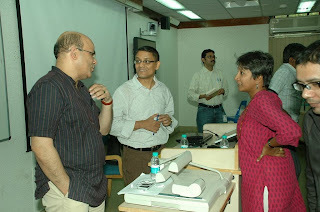 We got the sense that these participants were not as unstructured and fluid as is our common notion of a start-up. Given the size of a typical start-up, there is little need for a formal idea management system, and formal efforts to engender participation. Instead, the most important and relevant dimensions of our 8 Steps framework are those related to experimentation, going from proof of concept to incubation, and business model exploration. 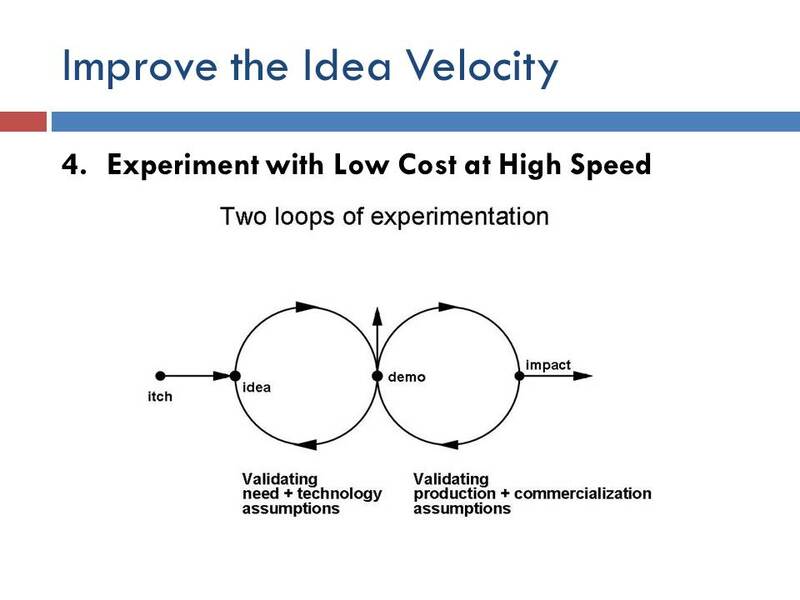 Start-ups would do well to include such approaches in their innovation process. I felt that the start-ups we met (and others in general) would benefit by sharpening their ideas using the notion of the challenge book that we wrote about in chapter 2 of "8 Steps". 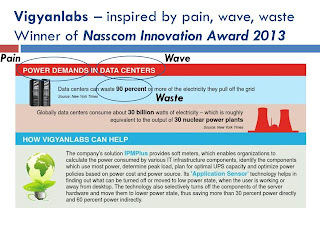 Vigyanlabs, a company I wrote about earlier, illustrates the power of this approach that focuses on identifying pain, wave and waste to guide ideation. 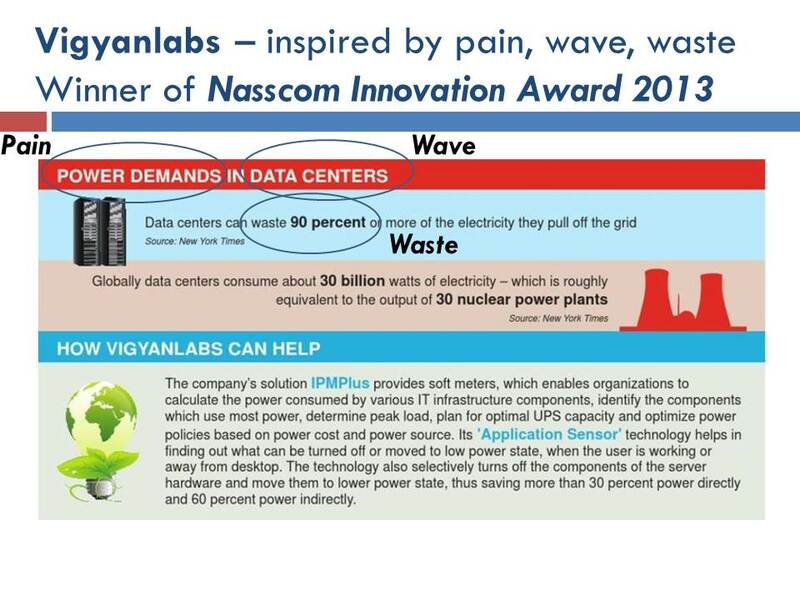 Vigyanlabs' patented solution addresses the high power wastage (pain, waste) by data centres (clearly a wave given the momentum with which IT is moving up the cloud). 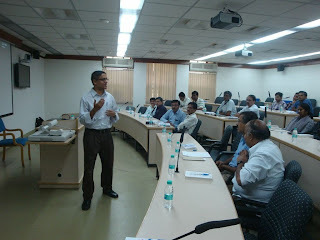 By their very nature, start-ups work in a sandbox mode - all the entrepreneurs in our workshop were intensively engaged in making their enterprises successful. But, clearly, building the right partnerships was a valuable way of taking their ideas forward (10 out of 11 companies emphasized the importance of such partnerships). As we wrote in 8 Steps, such openness to collaboration can be a significant contributor to achieving impact from innovation. Many of the start-ups see partnerships and validation as key steps in managing risk. We were pleasantly surprised to find 8 out of 11 companies keenly aware of the need to de-risk their businesses. Steps 7 and 8 thus seem quite relevant too. Vinay and I hope to work more closely with start-ups in times to come!